﻿Hardly any other musician has released so little as Hasaan Ibn Ali, born William Henry Langford Jr., in 1931, who died in 1980. Just seven titles in all are his complete output, all of which he composed himself, all of them on the present Atlantic LP, and all recorded in December 1964. The saxophonist Odean Pope, who often practised with him, talks of a second recording session in 1965 for Atlantic, but the recordings were never released because Hasaan was sent to jail shortly afterwards; rumour has it that the tapes were destroyed in a fire – and it might well be that recordings with John Coltrane still exist somewhere or other. According to Odean Pope, Hasaan was not an easy person to get on with, and he was convinced of his talent to the point of arrogance. But despite this – or perhaps because of this – one listens spellbound to the 40 minutes on this LP, a legacy and never-fulfilled promise of an extremely talented man. 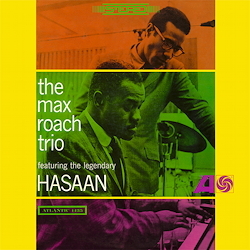 We are indebted to Max Roach, who persuaded the bosses of Atlantic Records to make these recordings. For many, many years they had vanished from the record market, but fortunately they are now available as an audiophile re-release to be listened to and admired.